If we can support young people to be smokefree, they are likely to remain smokefree for life – since very few people take up smoking after they reach their 20s. Young people are leading the way to a Smokefree Aotearoa as increasing numbers of 14 to 15 year olds have never even had a puff. Family smoking: A young person is 7 times more likely to start smoking if both parents smoke. If their parents quit, they are also more likely to quit. Access to tobacco products: Young people are more likely to take up smoking if they can afford to, and if cigarettes are easy to get. Tobacco advertising and promotion: Young people are easily influenced by advertising and seeing celebrities smoking. Social groups: Young people who smoke tend to hang out together. Teenagers are more likely to smoke if their friends smoke. Parental rules: Ensuring that no-one smokes inside the home or in the car protects children and young people. It helps if parents who smoke openly talk about concerns about their own smoking habit. 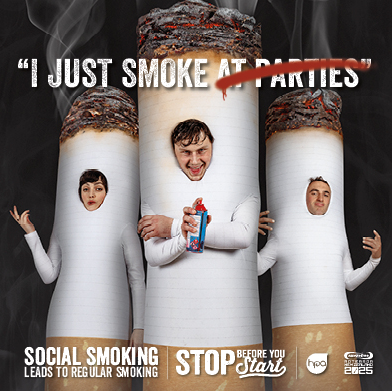 Social norms: It’s hard to be smokefree if smoking is common or normal. It’s illegal to smoke in or around the grounds of workplaces, hospitals, schools and early childhood centres. Find out about Community and Public Health’s work around smokefree public spaces, including the Fresh Air Project. Parents and caregivers are powerful role models. Kids copy what they see so supporting parents and caregivers to quit is an important part of developing a smokefree culture. Find out about the quit services available to those who smoke. raising taxes to make tobacco less affordable. Download or order smokefree resources from the Community Health Information Centre. Stop Before You Start puts a spotlight on young adult smoking behaviours, especially the turning point from experimental to regular smoking.